Trius at Hillebrand Sparkling Brut (non-vintage) | Wine Splash! After tasting this sparkling wine tonight from Trius Winery at Hillebrand in Niagara-On-The-Lake, Canada, I look for reasons to drink sparkling wine much more often! I bought this bottle from my last visit to Trius Winery last summer and it was definitely worth the wait. Great sparkling and great memories from a winery that loves to please the public palate. In my glass, straw in color with lively, small bubbles escaping to the rim! A very yeasty nose with nuances of apple and citrus. Medium bodied over the palate with a soft creaminess and fun effervescence! Flavors of young Bartlett pear, citrus, and lovely yeasty notes played like a symphony over my taste buds. On my second sip, sweet apple was pronounced followed by a long, elegant, crisp finish. I just wanted to jump up and yell “Bravo”! But I restrained myself, stayed seated, and drank a bit more of this wonderful bubbly. This is a blend of Chardonnay and Pinot Noir which was aged sur lie for up to 2 1/2 years. Amazing! Honestly, this is a fantastic, flavorful, bubbly with fruit, style, and elegance. 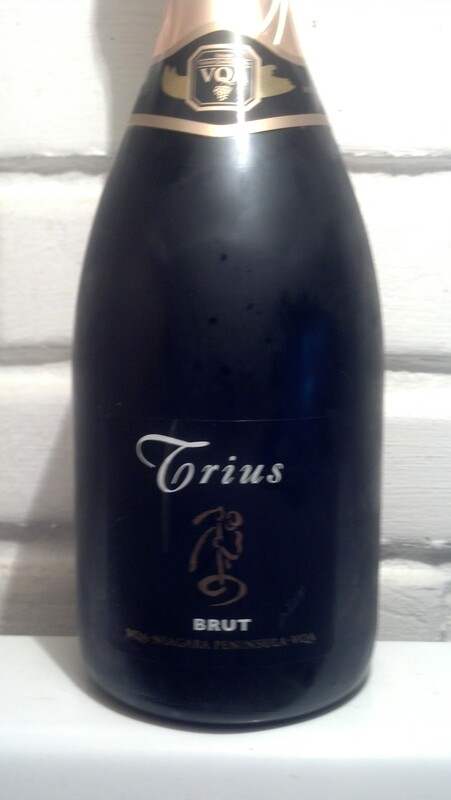 I feel this Trius Sparkling Brut is balanced in every way and deserves a 92 point rating. This sparkling would pair well with summer salads, glazed chicken, pasta alfredo, vegetarian spring rolls, baked whitefish and most other seafood with lemon. This is a non vintage sparkling brut and should cellar well through 2018. But who can wait? I will be back to Trius Winery at Hillebrand soon to stock up on more of this wonderful sparkling wine. WineSplashing!! I bought a bunch of the trius reds a few years ago – fantastic. Makes my palate water for a sip! Let us know when you are headed back so we can join you!